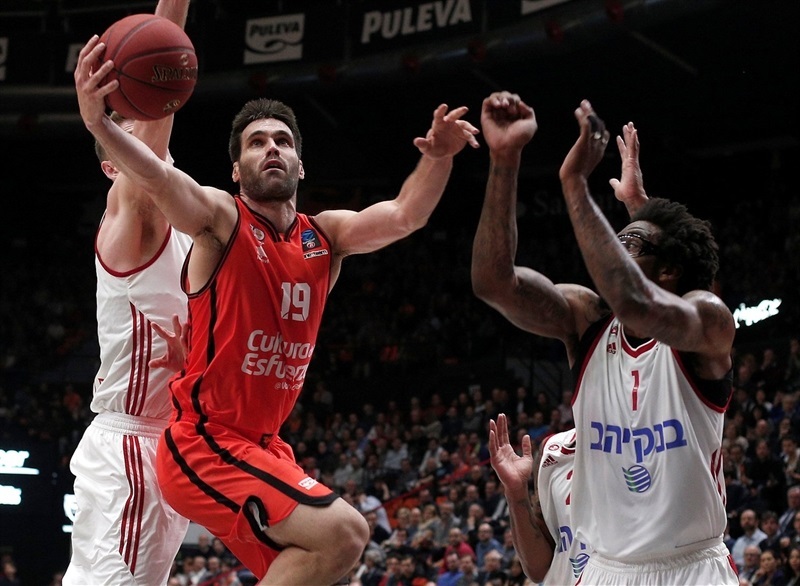 Valencia Basket pulled away late for an 83-68 victory over Hapoel Bank Yahav Jerusalem on Tuesday at Fuente de San Luis in the opening game of their best-of-three EuroCup Semifinals series. Fernando San Emeterio scored 11 of his 21 points down the stretch to help Valencia preserve the game and Bojan Dubljevic posted 11 points and 10 rebounds for the hosts, who claimed 14 offensive boards and outrebounded Jerusalem 36-31. 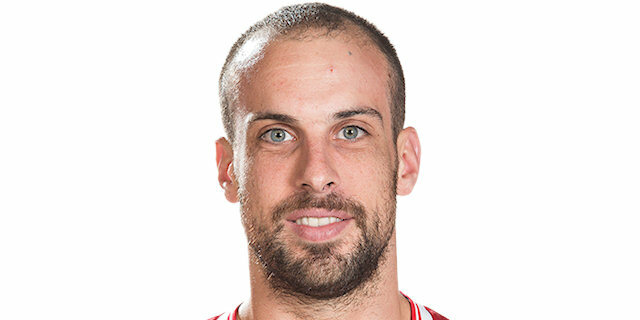 Joan Sastre also scored 11, Sam Van Rossom dished 7 assists and Rafa Martinez became the all-time leader in three-pointers made in the competition when he hit his 208th shot from downtown in the second quarter. Valencia trailed by 7 in the second quarter, but used an a 11-0 second-quarter run to lead 36-35 at the break. A 9-0 third quarter run helped Valencia to a double-digit lead and though Jerusalem rallied to within 2 in the fourth quarter, it ran out of steam as Valencia marched to victory. 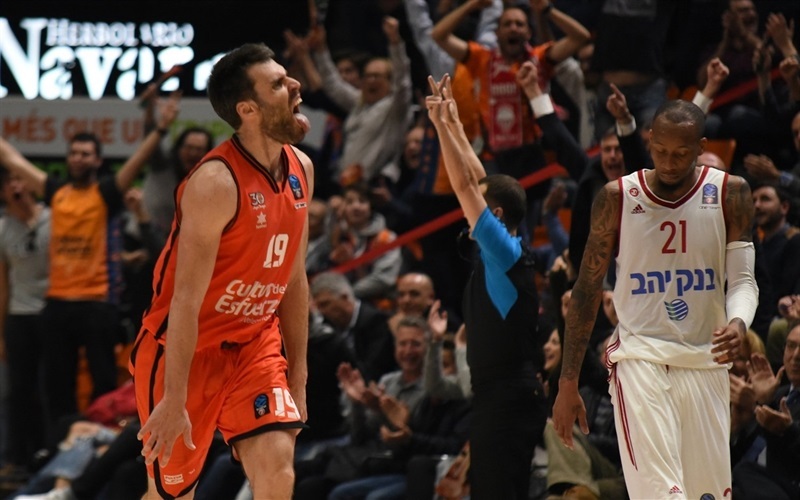 Tarence Kinsey paced Jerusalem with 22 points, Curtis Jerrells tallied 13 points and 5 assists and Amar’e Stoudemire posted 10 points and 8 rebounds in defeat. Valencia went to Dubljevic on its first three possessions and took a 3-2 edge. Kinsey played a big role at both ends with early rebounds, a key steal and a pair of jumper before Stoudemire dunked to make it 3-8. Joan Sastre sank the game’s first three, but Stoudemire kept the visitors head with another slam. 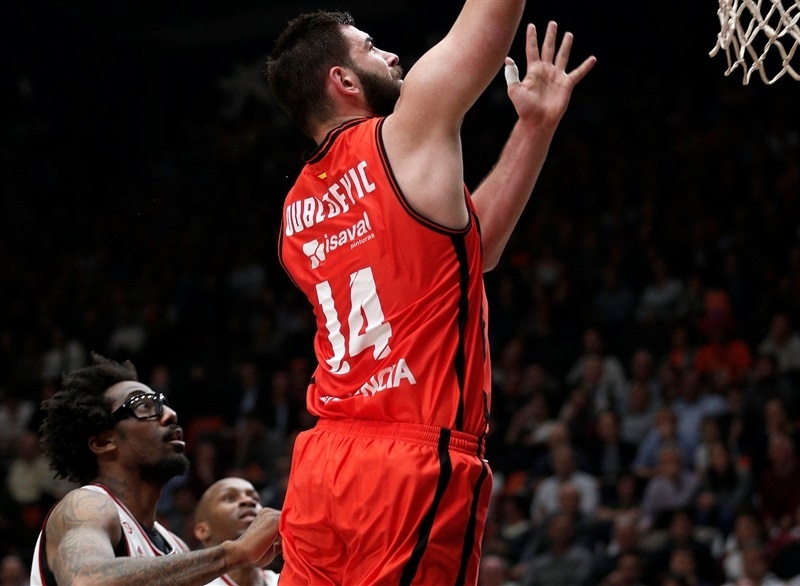 Martinez tied the three-point mark with his first three of the night and narrowed the gap before Luke Sikma scored 4 quick points for a 15-12 Valencia edge. Romain Sato added to the margin with a three, though Kinsey kept Jerusalem close with a layup and an assist on a Jerrells triple that made it 20-19 after 10 minutes. Shawn Jones put the visitors ahead with a put-back slam to start the second quarter. A second Jones bucket in the paint made it 20-25 before a Pierre Oriola slam gave Valencia its first points of the quarter. Bar Timor’s steal set up Jones for a slam and a 22-29 advantage, which prompted a Valencia timeout. Van Rossom’s jumper revived the hosts before Martinez struck with the record-setting three. San Emeterio banked in a second-chance shot to tie it and Sikma dunked to give Valencia a 33-29 lead. San Emeterio capped the run at 11 unanswered points, but Jerrells and Yotam Halperin assisted on each other’s baskets to tie the game. San Emeterio converted a basket-plus-foul for a 36-35 halftime edge. 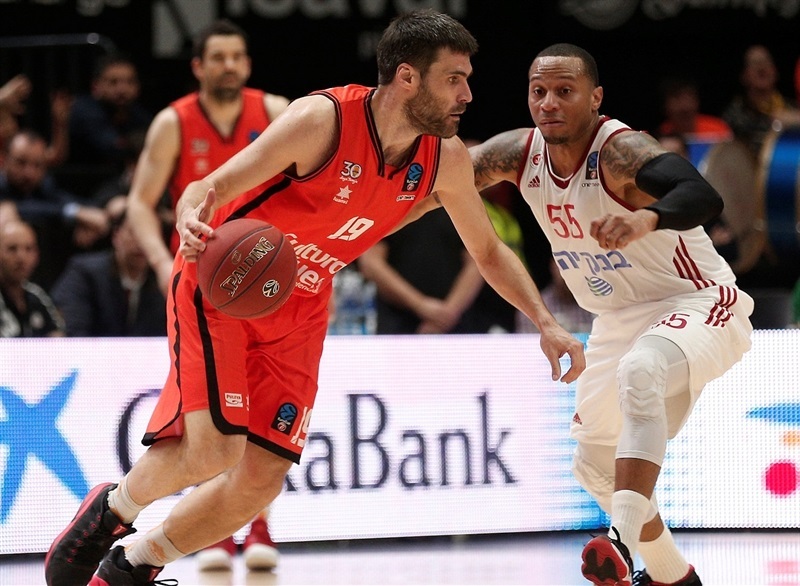 Dubljevic got going for the hosts and Sastre connected from downtown split free throws to make it 44-37. 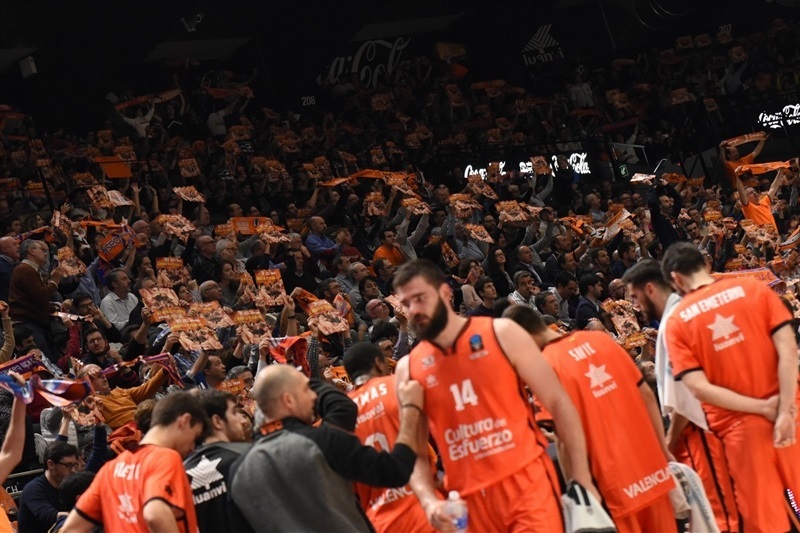 Sikma nailed a three from the top of the key as the Valencia fans started to sing with the team up 10. Stoudemire ended the Jerusalem drought and Jerome Dyson penetrated for a layup that narrowed the gap to 47-43 and saw Valencia call timeout. Travis Peterson made it a 3-point game with a three from the wing, but Will Thomas and Dubljevic scored the next 6 points. Kinsey beat the third quarter buzzer to make it 55-48. Jerrells opened the fourth quarter with a layup and Halperin drilled a three-pointer to get the visitors within 2. Van Rossom gave the fans something to sheer about with a drive and a three-point play, but Kinsey responded with a three at the other end. Van Rossom remained hot with an assist to Dubljevic and a long jumper. A Sato tip-in made it 64-56 with six minutes to go. 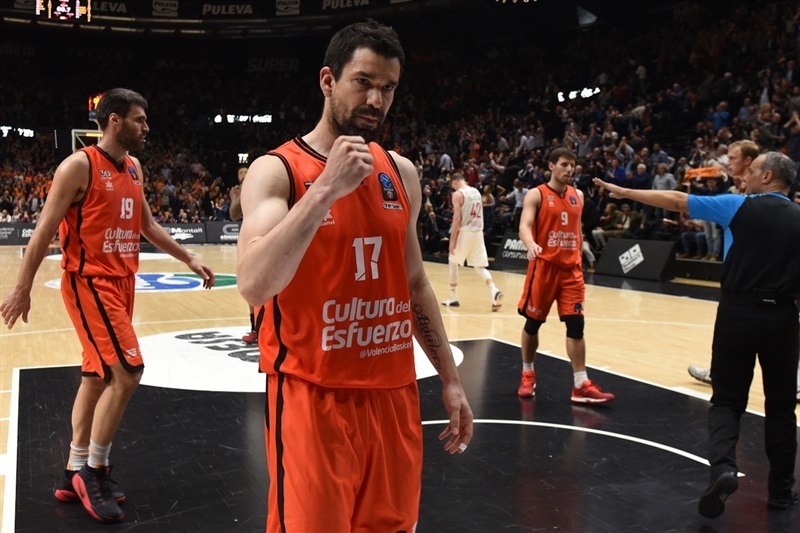 The Valencia defense continued to hound the visitors and a steal and slam from Sastre made it a double-digit margin. San Emeterio’s drive put Valencia up 71-59 with three minutes left and Jerusalem never got closer than 10 the rest of the way. "It was a very hard game with a lot of physical contact, with very aggressive defenses. I think San Emeterio had good numbers, but his game is not based on that. 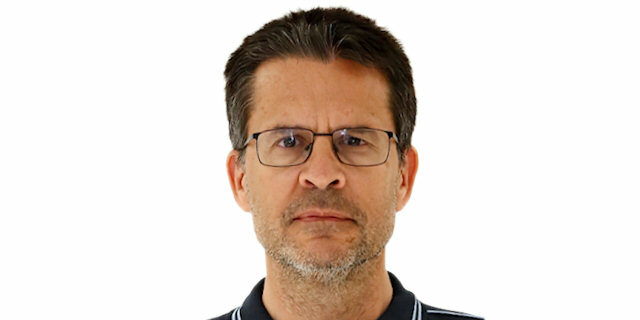 He is a total player, perimeter, post, playmaking, defense, but I think that Sastre and Rafa [Martinez] playing point guard made a very big effort in what is not their natural position." "We played good basketball in the first half, but we made a few mistakes in the end that let them back in the game. When you come to a road game in Valencia, if you make these kinds of mistakes and turnovers, you pay for them in the end. "